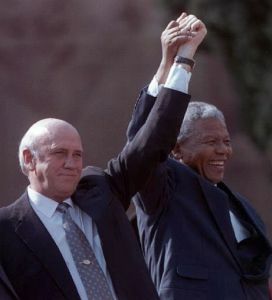 In 1993 South African political activist Nelson Mandela shared the annual Nobel Peace Prize with South African President F.W. de Klerk. Mandela’s Nobel Peace Prize address on December 10, 1993 in Oslo, Norway appears below. I am indeed truly humbled to be standing here today to receive this year’s Nobel Peace Prize. I extend my heartfelt thanks to the Norwegian Nobel Committee for elevating us to the status of a Nobel Peace Prize winner. I would also like to take this opportunity to congratulate my compatriot and fellow laureate, State President F.W. de Klerk, on his receipt of this high honour. It will not be presumptuous of us if we also add, among our predecessors, the name of another outstanding Nobel Peace Prize winner, the late African- American statesman and internationalist, the Rev Martin Luther King, Jr. These countless human beings, both inside and outside our country, had the nobility of spirit to stand in the path of tyranny and injustice, without seeking selfish gain. They recognised that an injury to one is an injury to all and therefore acted together in defence of justice and a common human decency. Thus, it will mark a great step forward in history and also serve as a common pledge of the peoples of the world to fight racism wherever it occurs and whatever guise it assumes. At the southern tip of the continent of Africa, a rich reward is in the making, an invaluable gift is in the preparation, for those who suffered in the name of all humanity when they sacrificed everything — for liberty, peace, human dignity and human fulfillment. This reward will not be measured in money. Nor can it be reckoned in the collective price of the rare metals and precious stones that rest in the bowels of the African soil we tread in the footsteps of our ancestors. It will and must be measured by the happiness and welfare of the children, at once the most vulnerable citizens in any society and the greatest of our treasures. The children must, at last, play in the open field, no longer tortured by the pangs of hunger or ravaged by disease or threatened with the scourge of ignorance, molestation and abuse, and no longer required to engage in deeds whose gravity exceeds the demands of their tender years. Far from the rough and tumble of the politics of our own country, I would like to take this opportunity to join the Norwegian Nobel Committee and pay tribute to my joint laureate, Mr F.W. de Klerk. He had the foresight to understand and accept that all the people of South Africa must, through negotiations and as equal participants in the process, together determine what they want to make of their future. We do not believe that this Nobel Peace Prize is intended as a commendation for matters that have happened and passed. We hear the voices which say that it is an appeal from all those, throughout the universe, who sought an end to the system of apartheid. Moved by that appeal and inspired by the eminence you have thrust upon us, we undertake that we too will do what we can to contribute to the renewal of our world so that none should, in future, be described as the wretched of the earth. Let it never be said by future generations that indifference, cynicism or selfishness made us fail to live up to the ideals of humanism which the Nobel Peace Prize encapsulates. Let the strivings of us all, prove Martin Luther King Jr to have been correct, when he said that humanity can no longer be tragically bound to the starless midnight of racism and war.